White blood cells (WBCs) serve as the principal actors of the immune system. The 5 classes of WBCs, or leukocytes, differ in appearance and function. These classes include neutrophils, monocytes, lymphocytes, eosinophils and basophils. WBCs function primarily to protect and defend the body against infectious invaders, including bacteria, viruses, fungi and parasites. A reduced number of white blood cells in the body, called leukopenia, can leave the body vulnerable to wide variety of infectious diseases. Neutrophils are normally the most abundant of the white blood cells. The bone marrow typically produces approximately 100 billion neutrophils daily, and these WBCs normally account for roughly 50 to 70 percent of leukocytes in the bloodstream. Neutrophils play a crucial role in fighting infections, especially bacterial and fungal infections. Their role in viral infections remains an area of active research. Neutrophils are phagocytes, meaning they surround and engulf invading germs, which are then killed and digested. They also produce microscopic webs, known as neutrophil extracellular traps (NETs), that ensnare disease-causing germs. Neutrophils migrate through blood vessel walls into the tissues in response to chemical signals triggered when an infectious invasion occurs. Lymphocytes are normally the second most abundant type of WBC in the bloodstream, account for roughly 20 to 40 percent. Lymphocytes circulate between the bloodstream and lymph nodes and other lymphatic tissue, such as the spleen. Although they look the same under the microscope, two types of lymphocytes -- T cells and B cells -- exist and perform different functions. B cells produce proteins called antibodies, which target invading germs for destruction by other immune system cells. T cells aid in recognition of infectious invaders and activation of other immune system cells. Cytotoxic T cells and natural killer cells are special types of T lymphocytes that attack and kill abnormal cells, such as cancer cells and virus-infected cells. Monocytes are the largest type of WBC, and normally account for roughly 1 to 10 percent of leukocytes in the bloodstream. They possess receptors that detect chemical signals indicating infection or tissue inflammation, and other receptors that recognize invading organisms. Monocytes are highly versatile immune cells that undergo further maturation -- known as differentiation -- that enables them to perform specific functions. Monocytes normally circulate in the bloodstream for several hours to a few days before migrating into the body tissues, where they differentiate into macrophages. These cells are capable of engulfing and killing infectious organisms, especially bacteria. They also secrete a variety of immune system signaling chemicals, which can either promote or suppress tissue inflammation. Macrophages also interact with T cells to help the immune system recognize and react to infections. Eosinophils normally account for roughly 1 to 4 percent of the leukocytes circulating in the bloodstream. 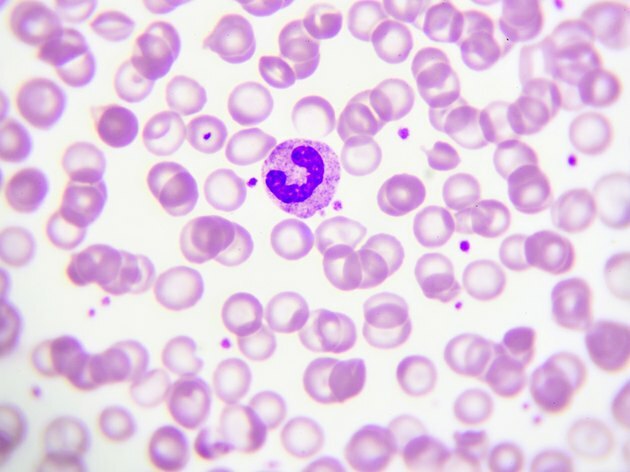 Eosinophils are particularly important in fighting parasitic infections. Human parasites range in size from single-celled organisms, such as those that cause malaria, to tapeworms that can grow to 16 feet or longer. Eosinophils are also capable of phagocytosing bacteria, although less efficiently than neutrophils and macrophages. These WBCs play a role in certain types of allergic reactions as well. Markedly elevated levels of eosinophils can potentially cause organ and tissue damage, with the heart, lungs, spleen and skin most often affected. Basophils are the least common type of WBC, accounting for less than 1 to 2 percent of leukocytes in the bloodstream. These WBCs are less well understood than other types of leukocytes, but research has uncovered some of the functions of these cells. Basophils possess surface receptors that bind a type of antibody responsible for triggering allergic reactions. Basophils and their tissue counterparts -- called mast cells -- release histamine when allergy-specific antibodies on the cell surface encounter a triggering substance. While the release of histamine occurs almost immediately, production and secretion of other immune system signaling chemicals from basophils is believed to perpetuate allergy-induced tissue inflammation and the symptoms associated with it. Hematology: Clinical Principles and Applications, 3rd Edition; Bernadette F. Rodak, et al. Immunology: Natural Killer Cell Cytotoxicity: How Do They Pull the Trigger? Which White Blood Cells Are Phagocytes? What Are the Causes of Low White Blood Cell Count & Weight Loss?